Edwin Whitely, head of school broadcasting. Educational broadcasting demands a continuous dialogue between representatives of the worlds of education and television. The three essentials of the operation — planning, programme production, and followup — can only be achieved through teamwork. The school broadcasting section of Rediffusion Television is designed to establish teams on a practical basis. The section consists of: a head of school broadcasting, an assistant head of school broadcasting, education officers, television directors, a script editor, a schools liaison officer, a manager, together with production assistants, stage managers, and secretaries. The operation is complex as the three constituent parts are all happening simultaneously. Planning of future series is taking place while production of present programmes and evaluation of past broadcasts are in full swing. The processes outlined below, therefore, should be seen as overlapping and not separate functions. 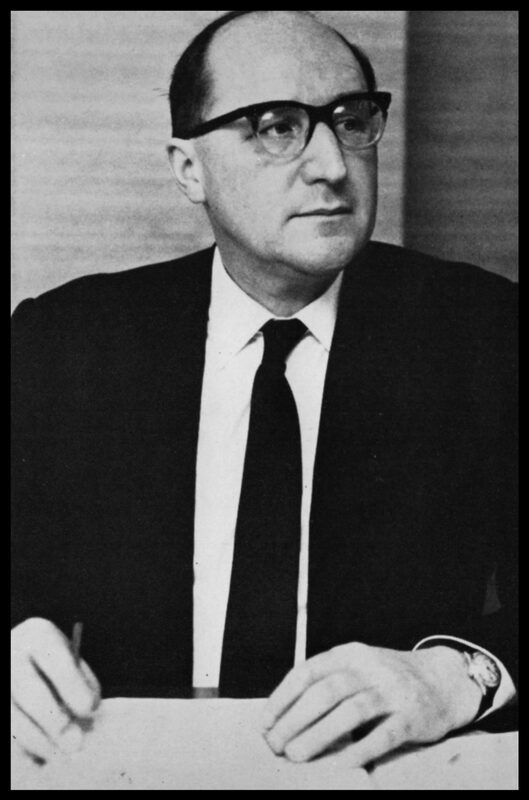 The educational advisory council about which Sir Ifor Evans has written, is the link between the section and the educational world. It advises the section on the overall balance of programme series and scrutinises the section’s implementation of that advice before approving the programme schedule for the next academic year. The section’s first task is to translate the council’s advice into terms of subject areas and programme series within the framework of the time available and the national pattern of educational television broadcasting. Ideas for series come from many different sources — teachers, educational writers, advisers and members of the section. A meeting of the whole section discusses and decides the series it proposes to offer. Teams, made up from members of the section representative of all interests, are formed with the task of providing a working paper. The teams consult teachers, lecturers and experts in the field, and prepare a working outline of the proposed series. The essential features of this are the topics to be presented, the length of the series and each programme in it, the age-range of the children for whom it is intended and the general method of treatment of the subject. These papers are presented to the advisory council at a meeting which members of the section attend. The council makes its comments on the papers and suggests additions or modifications. On the basis of these, and after further consultations with specialists in ad hoc meetings, final proposals are drawn up and approved. 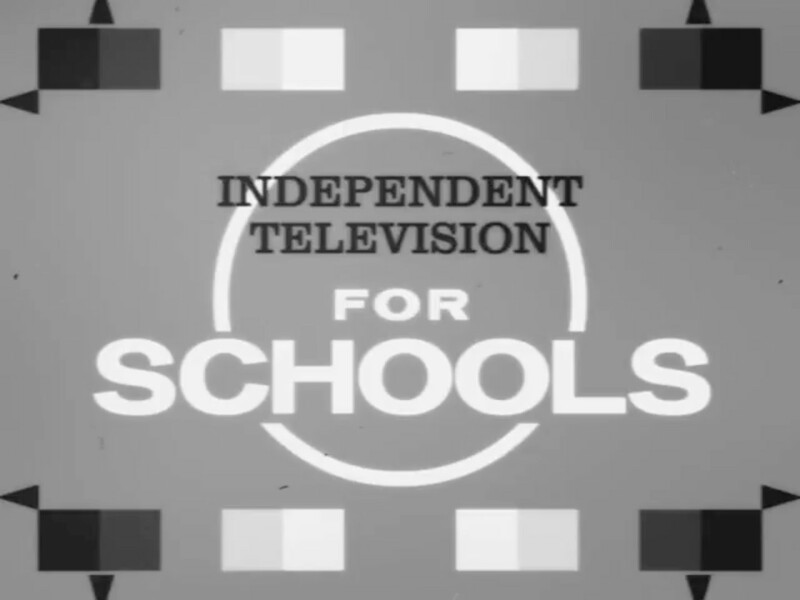 These final proposals are then considered by the schools committee of the Independent Television Authority in relation to the whole output of Independent Television for schools. When the various series have been approved, and the network time-table drawn up in consultation with the school broadcasting officers of other Independent Television companies, a production team for each series is formed. This is the heart of the operation. The nucleus of each team consists of a director and an education officer. Together they plan the production of each programme; the director concerning himself mainly with the technical aspects and the education officer mainly with the educational content. At all stages — the appointing of script-writers and series advisers, consultation with teachers (either individually or at ad hoc meetings), selection of film from library stock, special shooting of film, rehearsals outside and in studio, and choice of presenters — the director and education officer work in harmony to co-ordinate their different expertise. The education officer, invariably a former teacher, will keep himself constantly in touch with educational thought and practice. The director is a professional television director experienced in the techniques of his art. Together they are aware of the demands and limitations of educational television and are responsible for shaping the production. The stage manager, production assistant and the studio staff work with the director to translate all this into a television programme. Before any series is transmitted, the link between the section and viewing schools has to be strongly confirmed. Information about future series has to be sent to teachers in the form of programme literature. The production teams provide this information which is prepared for publication. The annual programme booklet, containing an outline of all the series to be transmitted is sent to all schools around Easter for broadcasts starting in the next academic year. This allows time for broadcasts to be fitted into school time-table patterns. The programme booklets for each series are written by the production teams and their preparation for publication is the work of various members of the section. 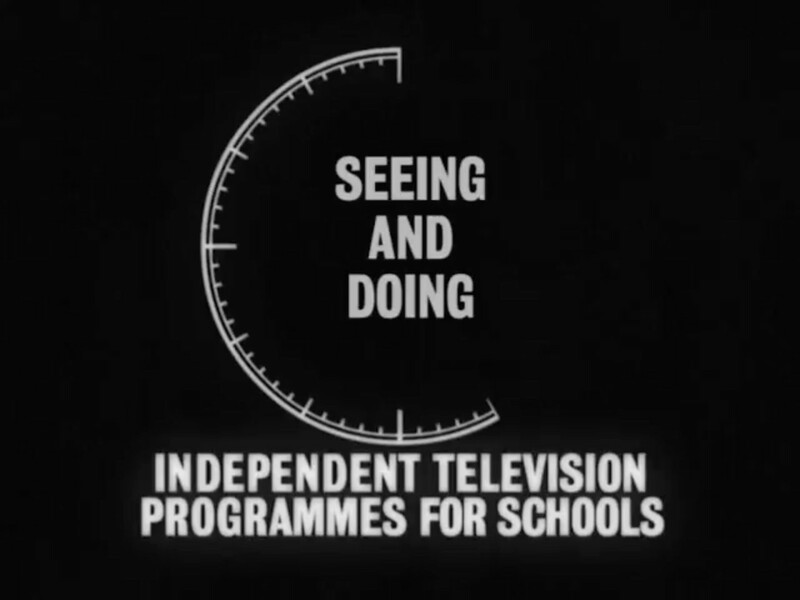 The schools information office keeps a record of all the schools in the London area and details of those which are registered as viewers of Independent Television programmes. The secretary, education and schools liaison officer deal with all inquiries from schools, and ensure that all relevant information is sent to them. While series are being broadcast, close contact is maintained with the users of the programmes. The section, and especially the production teams, need to be sure that the programmes are pitched at the right level for the classes for which they are intended. The schools liaison officer, through the schools information office, organises a reporting panel for each series. 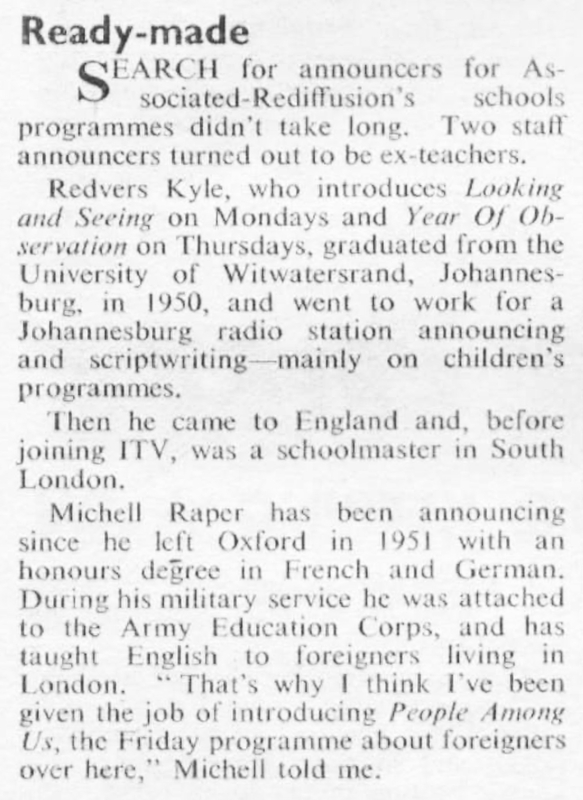 Teachers are asked to complete, at the end of each transmission, a simple reply-paid card giving the producers their immediate reactions to the programme. This feed-back of information is very valuable and influences production of future programmes. There is, however, no substitute for personal contact at the classroom level. Reports from teachers — and many come from teachers using the programmes who are not members of reporting panels — are supplemented by reports from various members of the section who regularly visit schools to view programmes with children and their teachers. Sometimes a special investigation into the use of a series is undertaken with a group of schools. Teachers send in regular reports and examples of work inspired by the programmes. At the end of the series the teachers meet the production team to discuss the series as a whole. At the end of each term a report is drawn up evaluating the reception of the various series. Personal contacts with schools and teachers are extended in talks and demonstrations which members of the section give to various organisations. A team will visit a college of education to explain the work of the section, show a demonstration print of a programme and discuss with students the use of educational television. Members of the section attend meetings of teachers’ organisations, teachers’ conferences and parent-teacher associations to discuss programmes with them. We maintain contact, at conferences and through visits, with other broadcasting organisations, at both national and international level. It must be remembered, too, that educational television has a responsibility to be forward-looking. New ideas in education are constantly being formulated and members of the section are in touch with individuals and organisations concerned with the development of new ideas and methods. Part of our day-to-day work is to incorporate these in our programmes. In its new project “Teachers and Television”, Rediffusion Television is trying to strengthen even further its contacts with teachers. Teachers come to the studios to see and experience the operations for themselves. They meet members of the section and, through devising their own short programmes in groups, gain an idea of the production side. The aim is to create mutual understanding and confidence, and to enable teachers to become better-informed users of the programmes. This is not the place to go fully into the mechanics of scheduling studios and controlling finance. All members of the section play their part in the supporting work behind programme production. There is a singleness of purpose throughout and that is to serve the children in schools to the best of our ability. The strength and future progress of educational television lies in the continued and growing intimacy between us as producers and the users of the programmes. This is what makes the demanding and exciting nature of our complex operation so rewarding.